This Toronto plant is ideally situated on the shore of Lake Ontario. The engineers’ in-house architect, Thomas C. Pomphrey, was responsible for the building design in the classical Beaux Arts style. The stunning interior finishes and the immaculate lawns surrounding the plant make it, as it has been called, A Palace of Purification”. Michael Ondaatje has’, and the workers who built it,’ in his novel ”In the Skin of a Lion”. The grounds are open at all times and tours of the plant are available to the public. Location: Queen St. E. and Victoria Park Ave. Toronto’, Ontario. In 1912, R.C. Harris was appointed City Engineer and Commissioner of public Works of the City of Toronto. His first major project was the prince Edward Viaduct crossing the Don River (National Historic Civil Engineering site – 1986). 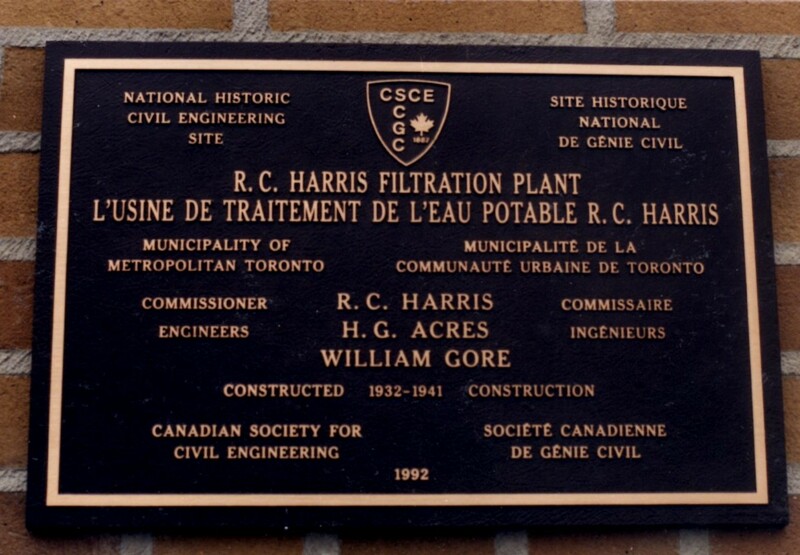 This plant was built when the first filtration plant on the Toronto Islands became too small. City Council retained consulting engineers H.G. Acres and William Gore for the design and construction of the new plant, started in 1926. Due to Harris’ and his consultants’ foresight, plenty of space was left for the plant’s expansion which took place between 1955-1958 at a cost of $7.3 million. 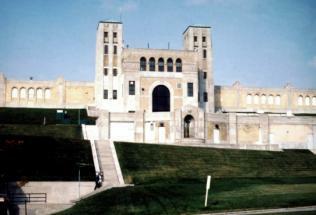 It is Metropolitan Toronto’s largest water filtration plant and has a rated capacity of one million cubic metres per day. Henry G. Acres was born in Paris, Ontario in 1880 and graduated from the University of Toronto in Mechanical and Electrical Engineering. He became one of the first employees of the newly established Ontario Hydro, was made Chief Hydraulic Engineer in 1911 and was put in charge of power development at Niagara Falls, Ontario Hydro. In 1924, Acres established his own consulting firm, specializing in electric power generation and municipal engineering. Coincidently, both Harris and Acres died in September, 1945.